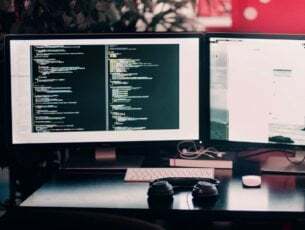 With the latest version of Internet Explorer 11 on the market, I am sure you are as interested as me to find out what are the improvements and new apps implemented. Unfortunately, as promising as it sounds, Internet Explorer 11 has also brought with it some issues. 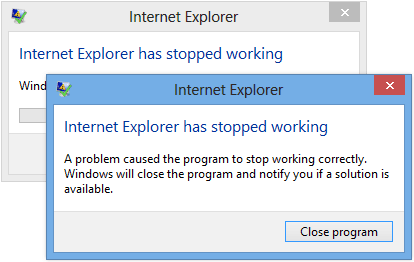 The major issue we have found with Internet Explorer 11 is when it crashes while using it on Windows 10 or Windows 8. Your Internet Explorer 11 can crash in Windows 10, Windows 8 for example if you graphics are not responding at a fast rate thus making the Internet Explorer 11 to stop responding or just close unexpectedly. Another way your Internet Explorer 11 might crash is if you have Add-ons installed that are not compatible with your new browser on Windows 10, Windows 8. We will give your more information on these issues in the lines below, as well as a way to fix them in the shortest time possible. Go to the “Tools” menu presented in the upper side of Internet Explorer. Click(left click) on the feature “Internet Options” you have in the Tools menu. Click(left click) on the “Advanced” tab you have in the upper side of the Internet Options window. Click(left click) on the “Settings” feature. 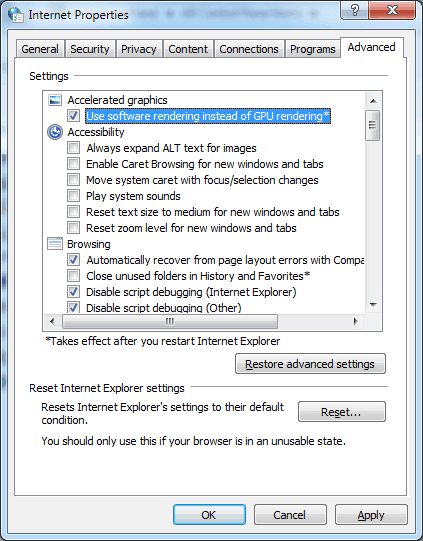 And place a check mark next to “Use software rendering instead of GPU rendering” which you can find in the “Acceleration graphics” topic. Click(left click) on the “OK” button situated in the lower side of the window. Reboot the Windows 10, Windows 8 PC and see if your Internet Explorer 11 keeps crashing. Note: If this workaround fixed your issue, then you will need to upgrade your graphics driver to the latest version compatible with Windows 10, Windows 8. Upgrading drivers manually is very annoying, so we recommend you to download this driver updater tool (100% safe and tested by us) to do it automatically. Thus, you will prevent file loss and even permanent damage to your computer. Press the “Enter” button on the keyboard (this will launch Internet Explorer 11 without the add-ons you have installed). If your Internet Explorer 11 is working properly now then one of your add-ons is causing this issue. Note: You can open your add-ons by going to the “Tools” menu and clicking (left click) the “Manage Add-ons” topic. 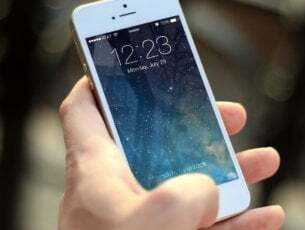 From there you can disable them and see if the issue persists. Click(left click) on the “Tools” menu situated in the upper side of the window. Click(left click) the “Advanced” tab in the upper side of the window. Click (left click) on the “Reset” Button. Click (left click) again on “Reset” in the new window that opened. 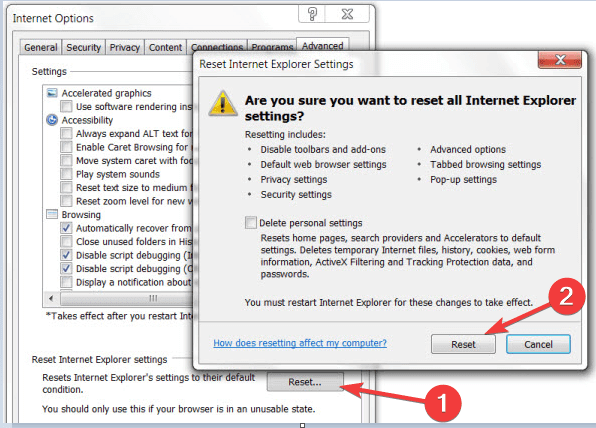 Wait for Internet Explorer 11 to reset to default settings. Restart the Internet Explorer 11. 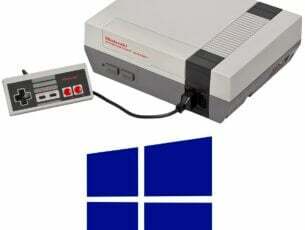 Restart your Windows 10, Windows 8 PC. See if the Internet Explorer 11 still crashes. In the “Windows Update” topic left click on the button “Check now” and let your Internet Explorer 11 check for any updates available for your system. After its finished close internet explorer and reboot your Windows 10, Windows 8 PC. Press and hold the buttons “Windows” and “S”. Uncheck the box next to Internet Explorer 11 presented in the window you opened. Left click on the “OK” button presented in the lower side of the screen. Reboot your Windows 10, Windows 8 PC to finish the uninstall. Now you only need to go back and check again the box next to “Internet Explorer 11” and reboot your Windows 10, Windows 8 PC, this way it will automatically re install Internet Explorer 11 in your system. It is always a safe bet to run a complete virus scan with your antivirus and let it remove any unwanted programs from the system and afterwards restart your Windows 10,Windows 8 PC. If the issue persists and you cannot surf the Internet because IE is constantly crashing on your computer, maybe it’s time to switch to a another browser. While Microsoft still offers support for IE 11 on Windows 7, 8.1 and Windows 10, there are many excellent alternatives out there. While Chrome is by far the most popular browser in the world, there are also many privacy-focused browsers as well as browsers suitable for old PCs — simply install the one that best suits your needs. So, these are the reasons that make your Internet Explorer 11 crash in Windows 10, Windows 8. Knowing which is the root-cause of the problem allows you to quickly fix it. Most common issue is that you don’t have the latest IE version compatible with your Windows 10, Windows 8 system. If this article was helpful or you need more information on the issue, let us know in the comments below.